With lots of fun-filled pictures, things to name and simple questions and activities, this first words board book is perfect for preschool learning. Read it together and help your toddler develop their speaking, listening, and observational skills as they learn to identify objects. Chunky tactile tabs invite little hands to turn the page and improve dexterity, and there's more hands-on learning throughout, your toddler will love pointing to and naming objects, from body parts and clothes, to things that go, colours, shapes, numbers, and more. Then when they have named the objects, there are other fun activities to try, like choosing your favourite foods to eat or making farm animal noises. 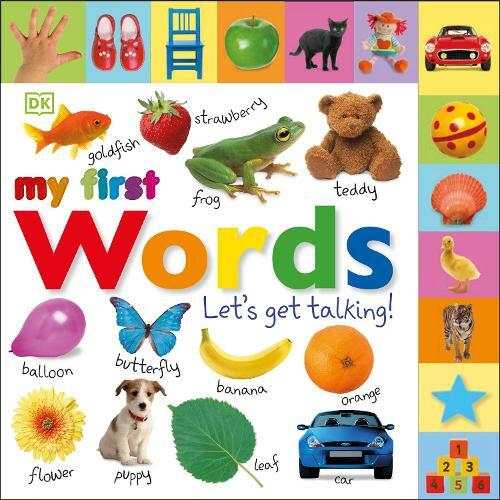 Packed with colourful pictures and activities My First Words: Let's Get Talking, is perfect for any inquisitive toddler, making teaching your child first words as easy as a, b, c!